As slots machines was created long time ago and gained extreme popularity among gamblers all over the world, it is no wonder that players try to find some unfair methods to win at slot machine. Here some of slots cheating methods in both land based and online casinos. 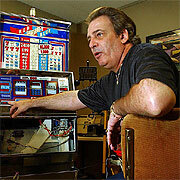 The first method of cheating at slots was invented and successfully used by Tommy Glenn Carmichael in the 1960s'. This method called the Monkey's Paw with the help of which it was possible to cheat the mechanical principle of the slot machine and make it payout. Later in 1985 Carmichael was caught and punished to be imprisoned in 5 years. Mini-lights. This one considered to be the most successful. The main principle of this method is that this very mini-light was directed at the sensor inside the slot machine confusing it about the payout in such way. But slots makers developed different protections in all modern slots machines in order to prevent such cheating. Some online casino players used to register several accounts on one online casino site. They play in all accounts simultaneously increasing the winning odds greatly. This method is well-known among online gamblers. It is very easy and simple to cheat an online casino in such a way. It is also possible to play online casino games as a team by several players. Players used to consult with each other using different messenger programs or simply cell phones. Using this method players increase their winning odds even more in comparison with the previous one. So, these are the most common slots cheating methods used by different players in the past and nowadays. And there is no doubt that there are a lot of them will appear in the future. But everybody should remember that it is very risky to use them. It is better to follow some slot tips for playing and winning at this game.